How does God view adoption? 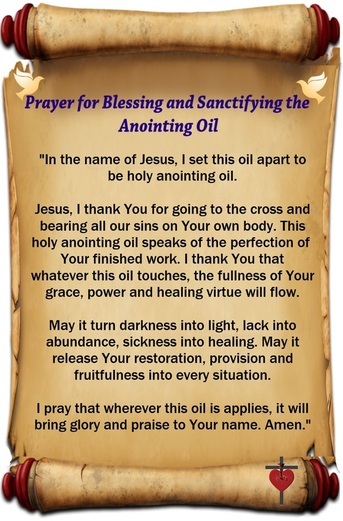 A significant oil used in the bible to anoint Prophets, Priests and Kings. Also used for prayer for healing, and for consecration of objects. 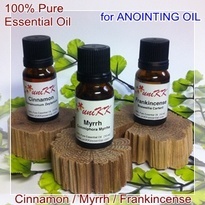 uniKK & uniCC supplies Anointing Oils of 100% 1st Grade Pure Essential Oil blended with Base Oil. Blessings to all churches - call us for Special Prices for church use. 1. You are anointed of God. Have you ever considered yourself to be an anointed Christian? Maybe you’ve thought that only certain people in ministry are anointed? Maybe you’ve only considered that the O.T. prophets and the N.T. apostles were the only ones anointed and that you are not. No matter what you have or haven’t thought about the anointing of God, if you are a Christian, then you have received an anointing. Do you know this anointing is? Do you know what it means to be anointed? According to Webster’s Dictionary, to anoint means to "rub oil or ointment on," "to put oil on in a ceremony of consecration." So, to anoint something or someone is to apply something, in this case oil, to an object. Maybe you have been anointed with oil in a prayer service, or when someone has prayed over you for healing. Maybe you’ve even done the anointing. Then again, perhaps the idea of anointing with oil is foreign to you. Whatever the case, anointing is found all over the Bible. Exodus 40:13, says "Then dress Aaron in the sacred garments, anoint him and consecrate him so he may serve me as priest" (NIV). 1 Samuel 16:3,13 says, "Invite Jesse to the sacrifice, and I will show you what to do. You are to anoint for me the one I indicate...13So Samuel took the horn of oil and anointed him in the presence of his brothers, and from that day on the Spirit of the LORD came upon David in power. Samuel then went to Ramah," (NIV). Mark 6:13 "They drove out many demons and anointed many sick people with oil and healed them" (NIV). Leviticus 8:10 "Then Moses took the anointing oil and anointed the tabernacle and everything in it, and so consecrated them," (NIV). For what purpose were they anointed? Prophets were anointed to be able to proclaim God’s word. Priests were anointed to carry out their duties of worship and sacrifice. Kings were anointed so they could rule. People were anointed for healing. Object were anointed so they could be set aside for holy use. As you can see, anointing is a very biblical concept and a common occurrence. Anointing occurs for a purpose: for proclaiming, for worship, for sacrifice, for ruling, for healing, and to make something ready for holy use. In fact, that is why Jesus was anointed, so that He could carry out His ministry. In Luke 4:18-19, Jesus quoted from Isaiah 61:1-2 and said, "The Spirit of the Lord is on me, because he has anointed me to preach good news to the poor. He has sent me to proclaim freedom for the prisoners and recovery of sight for the blind, to release the oppressed, to proclaim the year of the Lord's favor," (NIV). Alright, so now you know that anointing is biblical, that it was done for a variety of reasons, and that even Jesus was anointed. You may ask why this is important. It is important because it helps you understand better your need for anointing. 2. 1 John 2:27 says that you have received an anointing. You have been anointed, but with what? 13"Then Jesus came from Galilee to the Jordan to be baptized by John. 14But John tried to deter him, saying, "I need to be baptized by you, and do you come to me?" 15Jesus replied, "Let it be so now; it is proper for us to do this to fulfill all righteousness." Then John consented. 16As soon as Jesus was baptized, he went up out of the water. At that moment heaven was opened, and he saw the Spirit of God descending like a dove and lighting on him. Have you ever wondered why Jesus was baptized into John’s baptism of repentance? Some say it was to identify with us; there is much truth in that. Others say it was to be an example; there is also much truth there, too. Probably the main reason that Jesus was baptized was because it was at His baptism that He began His ministry and entered into the Melchizedek priesthood so He could become the High Priest and be the Holy Sacrifice. Amos 3:7 "Surely the Sovereign LORD does nothing without revealing his plan to his servants the prophets." 4Then bring Aaron and his sons to the entrance to the Tent of Meeting and wash them with water. 5Take the garments and dress Aaron with the tunic, the robe of the ephod, the ephod itself and the breast piece. Fasten the ephod on him by its skillfully woven waistband. 6Put the turban on his head and attach the sacred diadem to the turban. 7Take the anointing oil and anoint him by pouring it on his head" (NIV). Numbers 4:3 "Count all the men from thirty to fifty years of age who come to serve in the work in the Tent of Meeting" (NIV). So Jesus was probably 30 years old when He began His ministry. In Jesus’ baptism, He was anointed with the Holy Spirit that descended as a dove. Jesus was washed in baptism and He was anointed with the Spirit of God. If Jesus needed to be anointed, then so do you. Jesus said that He would send the Holy Spirit who would teach us all things (John 14:26). John 14:26, "But the Counselor, the Holy Spirit, whom the Father will send in my name, will teach you all things and will remind you of everything I have said to you. 1 John 2:27 "As for you, the anointing you received from him remains in you, and you do not need anyone to teach you. But as his anointing teaches you about all things and as that anointing is real, not counterfeit __ just as it has taught you, remain in him." The anointing you have received, then, is the Holy Spirit. 3. What does this mean, then, that you are anointed with the Holy Spirit? It means that you are anointed for Christian ministry while you live in this world. To be able to discern truth - 1 John 2:27. To testify of the truth - 1 John 5:6 "This is the one who came by water and blood __ Jesus Christ. He did not come by water only, but by water and blood. And it is the Spirit who testifies, because the Spirit is the truth." To be able to pray - Rom. 8:39 "and Ephesians 6:18 which says, "And pray in the Spirit on all occasions with all kinds of prayers and requests. . . "
To Live a righteous life - Romans 8:4 "in order that the righteous requirements of the law might be fully met in us, who do not live according to the sinful nature but according to the Spirit." To be strengthened with power in your inner being - Ephesians 3:16 "I pray that out of his glorious riches he may strengthen you with power through his Spirit in your inner being,"
To be led by God - Romans 8:9 "You, however, are controlled not by the sinful nature but by the Spirit, if the Spirit of God lives in you. And if anyone does not have the Spirit of Christ, he does not belong to Christ." To live in joy - Romans 14:17 "For the kingdom of God is not a matter of eating and drinking, but of righteousness, peace and joy in the Holy Spirit,"
To live in hope - Romans 15:13 "May the God of hope fill you with all joy and peace as you trust in him, so that you may overflow with hope by the power of the Holy Spirit." To receive spiritual gifts - 1 Corinthians 12:4 "There are different kinds of gifts, but the same Spirit." 1 Corinthians 12:7 "Now to each one the manifestation of the Spirit is given for the common good." To bear spiritual fruit - Galatians 5:22-23 "But the fruit of the Spirit is love, joy, peace, patience, kindness, goodness, faithfulness, 23gentleness and self-control. Against such things there is no law." It is this anointing that opens your mind, teaches you, guides you, calls you to pray, empowers you, and enables you to be stronger Christians, more powerful Christians. Not just people who are saved, but people who are saved, indwelt, and empowered. The Holy Spirit is received by faith in the sacrifice that Jesus made on the cross. Jesus said He would send the Holy Spirit and that the Holy Spirit would indwell His people. It is only because of the cross that you have forgiveness of sins, and the privilege of the indwelling Spirit, no only in you, but upon you. You are anointed vessels of God. You have been cleansed by God and been filled with the Holy Spirit. Not only is He in you but He is upon you. As the Holy Spirit came upon the disciples at Pentecost in the upper room and anointed them for service, you too have been anointed by God with the Holy Spirit for Christian service. I have taught you this so that you would learn about your anointing. Hopefully, with a better understanding of what God has given you in Christ and by the Holy Spirit, you will be better able to live for God, better able to pray to Him, love Him, trust Him, and better able to dwell in hope and joy. Types of Essential Oils reference in the Bible which we carry. The information in this web site is provided for purpose of sharing; "as is" and "as available" basis, and without any representations, warranties or conditions of any kind, whether express or implied, and including without limitation implied warranties of merchantability, fitness for a particular purpose, performance or durability. Copyright © uniKK & uniCC. All rights reserved.